I groaned. “Where I come from” (she comes from West Virginia) “we’d call this a dusting,” she said. “It wouldn’t close school.” She started get dressed to shovel the walk. She had her gallbladder out nine days ago. I really shouldn’t have let her do it by herself, but I was wrecked from my night with June and didn’t have the energy to argue with her about it. Noah was up before she made it out the door, so she got him into his snow pants and coat and took him with her. He, too, likes to shovel, and even more, to sprinkle salt on the sidewalk. As he slept through it the only other time shoveling and salting has been called for this winter, he was delighted. Beth usually gets Noah ready for school and takes him to the bus stop before getting on her own bus, but today this was unnecessary, so she left earlier than usual, around 8:00 a.m. It would be ten and a half hours before she returned. The last time it snowed, about two weeks ago, was a teacher in-service day at Noah’s school. Surrounding counties closed schools, but Montgomery schools didn’t need to because they were already closed. We had a lovely, almost charmed day. Noah was well behaved; June in good spirits. Her naps were well timed. I got to spend some rare one-on-one time with Noah. We watched Sesame St. together, a bit of a nostalgic treat, since he mostly watches television aimed at older kids now. 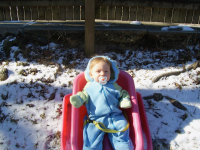 Later the three of us had a blast sledding in the yard, Noah cruising down the icy slope on his orange plastic sled, me towing June around the yard in her little pink one. I made lasagna for dinner and a chocolate cake from scratch, with Noah’s help. I thought, why is it I dread snow days so much? This would have been a fine one. All I forgot to do to was make him hot chocolate. I believe providing hot chocolate after sledding to be one of the solemn duties of motherhood. Lying in bed and snuggling with June while Beth and Noah cleared the walk, I strove to recapture the spirit of that day. I tried to will myself into a good attitude. We’d have fun. I’d remember the hot chocolate. I got up. “What should I do?” Noah’s whining started moments after Beth walked out the door, free as a bird. Okay, that’s not fair. She was probably in pain from overdoing it with the shovel and headed for a long, stressful day at a job she doesn’t love. Still, I felt a stab of jealousy, which I suppressed. Good attitude! Fun! Hot chocolate! “Go do your halfa-halfa,” I said. (Translation: play computer games. When Noah first started playing computer games he was limited to two fifteen-minute sessions a day, a limit we quickly abandoned when June was born. Still, remembering those half-of-a half-an-hour playtimes, he calls it halfa-halfa.) June was playing on the living room floor and I was down there with her reading the newspaper and occasionally looking up to comment on her play or hand her a new toy. It was a little too early for her first nap of the morning and I wanted her to sleep while Noah played on the computer, so I could lie down with her and get some rest. Given that, I probably should have waited to let him on the computer until we were ready to nap, but the chance to read the paper with interruptions from only one child was too tempting, so I sent him packing off to the study. Two hours later, when I came in with a freshly napped, changed and dressed baby, he was still there. It was baby story hour at the library in a half hour. I recently resolved to do more free or cheap organized activities with June (i.e. take her somewhere other than the playground and Starbucks), admittedly more for my own sanity than her enrichment. This story hour doesn’t happen very often so I really wanted to go, but I wasn’t sure I wanted to drag Noah along to an event aimed at babies. I also wasn’t sure it was even happening, given our region’s tendency to panic at the sight of a few snowflakes. I decided to call the library. No one answered. It was only a few minutes after the library was supposed to open so maybe no one was answering the phones yet, but we needed to leave right away if we were going, and Noah was still in pajamas, so I decided to forget it. “Halfa-halfa’s up,” I said. “Let’s go play in the yard.” We got Noah back into his snow pants, coat, hat and mittens, and June and I similarly bundled and ventured into the back yard. Noah dragged the sled up the slope and crept slowly down it. 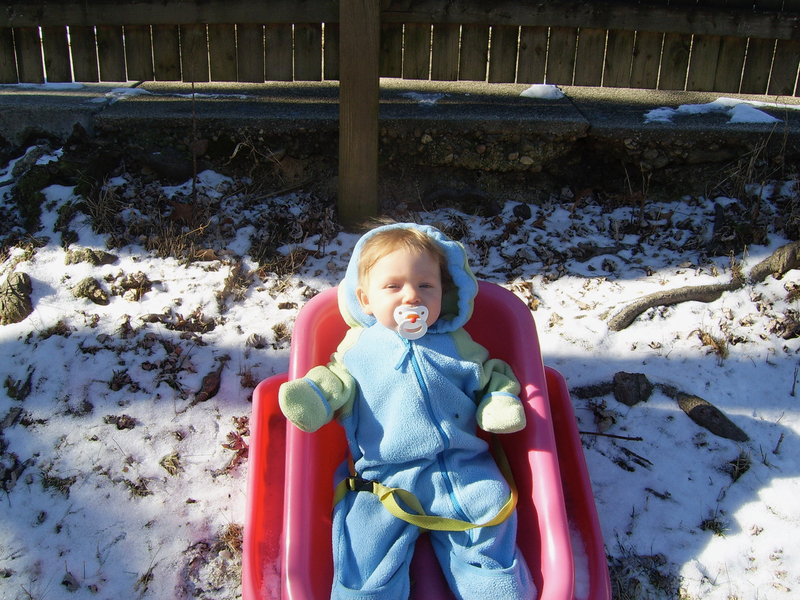 The snow was dry and powdery, useless for snowballs or snowmen, and just barely serviceable for sledding. He went down the hill a few more times, then bored of it. We took turns dragging June around the yard. She was tranquil, but not as enamored with it as the last time. “Can we go inside?” Noah asked. I checked my watch. We’d been outside fifteen minutes. It had taken longer than that to get dressed. “Let’s go for a walk,” I suggested, unwilling to let our outside time for the day consist of fifteen minutes of dispirited sledding. Talking him into this was a chore, but eventually we settled on a walk to the 7-Eleven with the promise of a treat. When we got home, I made the hot chocolate, and we watched a video. Afterwards we had lunch. The afternoon dragged on. Noah whined, June got crankier and crankier, pulling at her ears occasionally, other times chewing on her fingers. Was it an ear infection or teething? She slept long enough for Noah and I to read a little and build a marble run out of duplos, but he spent a lot of time watching television, playing computer games and listening to a cd of fairy stories while I tried to calm his increasingly hysterical sister. His total media time for the day was a shocking five hours, forty minutes. We don’t always manage to keep it to our goal of two hours a day, but this was a new high (or low). I ditched my planned dinner menu of homemade asparagus soup and instead heated up vegetarian chicken patties and made some spaghetti and a salad. After dinner, Beth and I discussed whether I should take June to the walk-in hours at the pediatrician the next morning to see if she had an ear infection. We decided to see how she slept and decide in the morning. Then right before bedtime, we had a bittersweet moment. As I tried to coax June into eating a little, Noah sang and danced around the dining room behind the high chair. She stood up in the chair and swiveled around to watch him, her face shining with adoration. This is how she looks at him as a matter of course, but I realized she had barely smiled all day. I went to bed soon after Noah did, leaving Beth to work at the computer. June did not nurse to sleep as expected, so I turned out the light, pulled her small body close to mine and hoped for sleep. I am thinking spring.